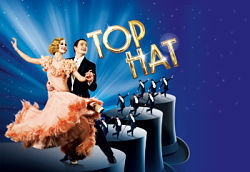 From 5th February there will be some cast changes to Top Hat the Musical at the Aldwych. As already announced, Gavin Lee will be replacing Tom Chambers as Jerry Travers but news today is that Broadway actress Kristen Beth Williams will be playing Dale Tremont, joined by Alex Gaumond as Alberto Beddini and Clive Hayward as Horace Hardwick. Vivien Parry continues as Madge Hardwick with Stephen Boswell as Horace's valet Bates joined by ensemble and swing members Michelle Andrews, Caroline Bateson, Jeremy Batt, Charlie Bull, Alan Burkitt, Matthew Cheney, Louise Davidson, Russell-Leighton Dixon, Matt Gillett, Jonny Godbold, Ian Goss, Fenton Gray, Alyn Hawke, Lauren Jade, Paul Kemble, Jenny Legg, Martin McCarthy, Grace McKee, Debbie Paul, Holly Rostron, Callum Train, Lois Urwin, Graham Vick, Alexandra Waite-Roberts and Aron Wild.